In this post, we will discuss about one of the easiest and commonly asked Bit Manipulation Interview Question i.e. Write a program to check if a given number is power of two or not? This post is continuation of our previuos article Program To Find Number Of Set Bits In The Number. Both of the approach mentioned in that post can be used to find if a number is power of two or not. How can we determine if a number is power of two or not? 0 00000 Zero is not having any set bit, so it is not a power of two. In this approach, we perform bitwise and (&) and bitwise right shift (>>) operations for each bit in a number. Step 1: (n&1) operation returns 1, if right most bit of the number is 1. Step 2 : If this returns 1, we increment our counter. 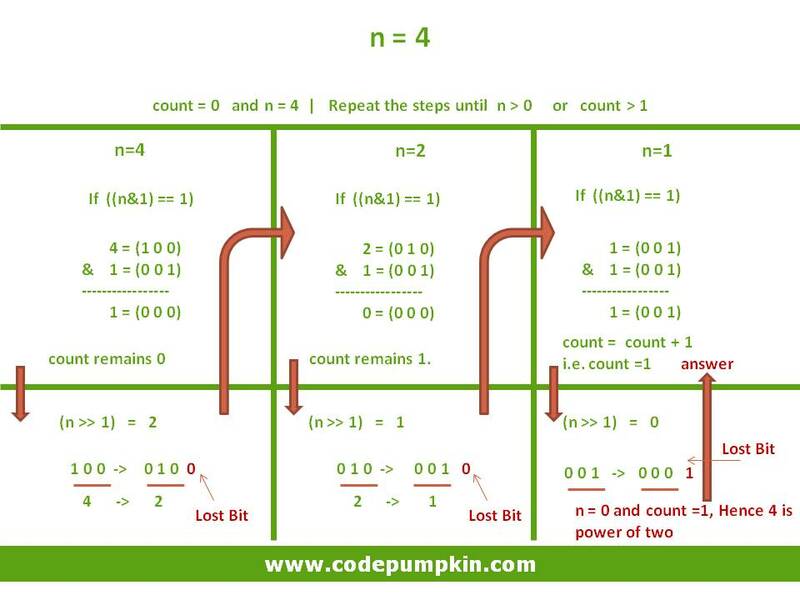 Step 3 : perform n=(n>>1) , so that we can check the value of 2nd right most bit. Step 4 : We will continue step 1 to 3 until n becomes zero. If we find second set bit in the number, we will break the loop and return false. 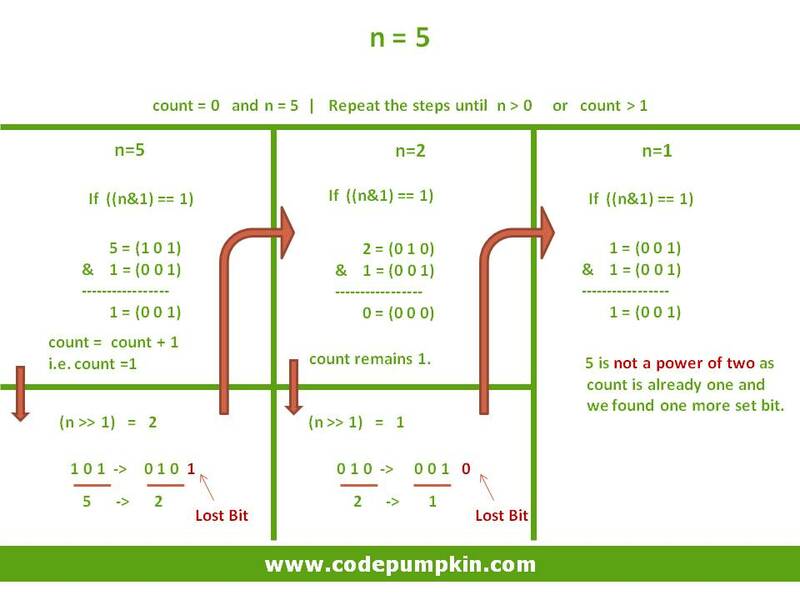 The naive approach requires one iteration per bit, until no more bits are set or second set bit is found. For Example, it will require 7 iteraton to check if 65 (0100 0001) is power of two or not? It uses n = n & (n-1) approach. If you perform bitwise & operation on n and (n-1), it produces the number with set bits one less than the original number. For example, if n has 4 set bits and if you perform n&(n-1), it produces the number with 3 set bits. So, if you are having one set bit in n, then n&(n-1) produces zero. We also need to keep additional check of (n>0) as for n=0, it will produce zero, but 0 is not the power of two. To understand more about Brian Kernighan's Approach, you check our article here.